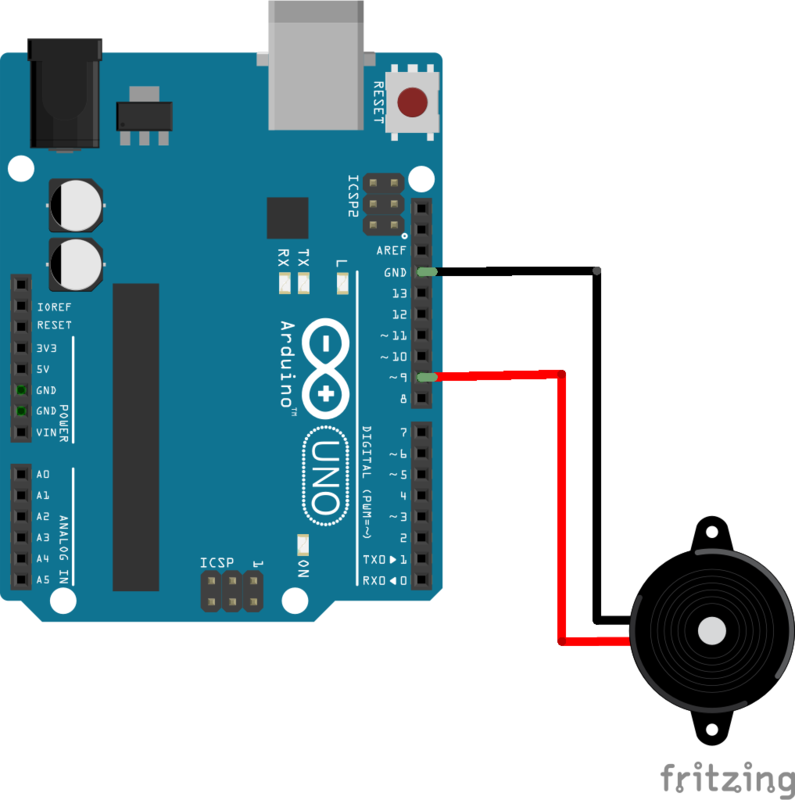 A very simple native application using ElectronJS to play music on a buzzer using an Arduino. Hello everybody! I wanted to share my latest creation on Hackster, which is a an app using ElectronJS to play songs on a buzzer using an Arduino! This project was a bit challenging as this is my first attempt at making an Electron app. This idea came to me as I wanted to make something using a buzzer, as I didn't experiment with buzzers often, so I decided to make something. Then it hit me — why not make an application to play music on it? I also noticed there is a library of songs that can play songs on a buzzer using Johnny-Five, so why not make an app to control a selection of songs over the Arduino? In fact, why not an Electron app?? And that's when I started making my idea! For this project, we're simply making an app that communicates down to our server, which is at the same level as our Arduino. For this project, it's very simple and very bare. The main objectives of the project were to make a working menu bar app, that communicates via websockets to start and stop the songs playing on the buzzer. Also, the app has to know when a song has finished playing to update the interface so the user knows the song is finished. Making a menubar application is a big step for someone that's new to ElectronJS, as opposed to making a simple Chrome-based application using a typical window. This in itself was quite challenging, but it's not impossible. For this project, I set out to fragment the application to work as an app that works with websockets, in order for the commands to be sent down to the server, which was on the same level as the robot's programming. In this case, main.js is where all of our Electron's application scripts go. It calls on an index.html file to use as the front end, with app/index.js being the front end's scripting. The robot.js file is used for the Arduino and also the server. There is also a config file, which is used to store the hostname and port for these files. Since this project is merely a menubar app, this is needing some configuration to not only show the window, but also make what is known as a 'tray'. // Once the app is ready, make the menu tray and create a new window. // Store the app's tray icon in a variable — required to make the tray. Using the code above in main.js, the Electron app will make a menubar tray, which, when toggled, will show or hide our application. On MacOS/OS X, this will place our application window directly beneath the centre of our app's tray icon! One other thing required for the menu tray to work is to show it during an event fired from the ipcRenderer, from our application front end, so under our scripts for app/main.js we send the 'show-window' event once the application's DOM (Document Object Model) has been loaded. And now we've got the application running as a menubar application! In `robot.js`, a server can be made that's exclusively for taking data sent from the application's front end, and vice versa. The idea is to build a server that runs under a specific port, with Websockets running on the server. // If the board is connected and is connected to the client, give a handshake. // When the app selects a song to play, stop the buzzer playing the current song, then play the selected song. // If the app selects a song that's already playing, stop the buzzer. Once the Arduino board is connected, it will wait for the front end to connect and, when successful, will let the front end know the app is connected to the Arduino. It's necessary for the Arduino board to be running alongside the server in order to run the app. Using Johnny Five and Julian Duque's j5-songs library, sockets can be set up to wait for the front end to press a button, and receive the button's value to play a song on the buzzer. In addition, the server will let the front end know when the song is finished. Another thing to add in the application's front end scripts is to set up the Websockets client, and where the sockets should connect to! In the button of each item, there's a data attribute called data-song that contains the Song ID of the list item's song, as specified in the Songs table in the j5-songs repository. The value stored in the data-song attribute will be sent to the server so the buzzer knows which song to play! // Store the song name in a constant. * When clicked, check if the item is already playing. * If so, tell the music box to stop the song and change the button text. * button text to say 'Stop' instead of 'Play'. * 'Stop', change its appearance back to the initial state. With the above script, we can loop through each list item, and then find if an item's button has been pressed. If it's not playing, it will send the song's ID through to the Arduino via a websocket, to play it, and got through the other items to see if their button was previously playing, to set them back to their initial state. If the specified button in the loop is already playing, it should stop playing the song on the buzzer and set the button back to its initial state. Also, if the song has ended on the Arduino, it will send the event to the front end and set the item's button back to its initial state. At this point, this is now a functional app! This was a pretty fun project! It was challenging at first, but I thoroughly enjoyed building an app to work with the Arduino, and was a joy to see it actually work! Extending this idea would include using an API and making a more dynamic front end, or use a similar app design to work with more complicated circuits. All you need is a buzzer, an Arduino, and two cables. Repository for the code and assets used in the project. Easy to set up and install, feel free to modify and fork! Hello! I'm Iain, a digital creator. I like making projects with code, art, and robots. Follow me for awesome projects and fun tidbits!